Need a bite to eat? A place to cool off? Lots of merchandise? Look no more. We have a variety of cafes and snack stands full of pizza, funnel cakes, ice cream and more. Need something extra? 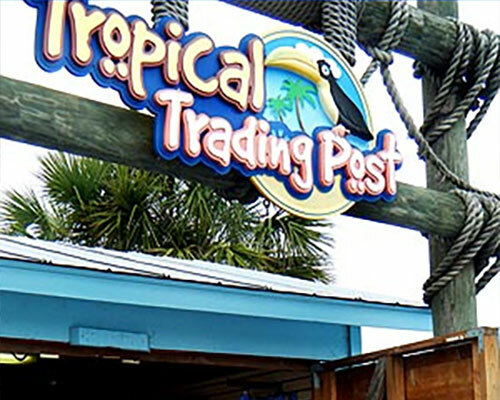 Make sure you visit the Tropical Trading post where you will find bathing suits, towels, souvenirs and everything else you’ll need for a day in the sun! 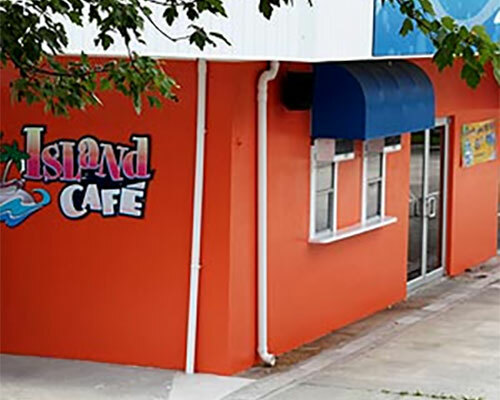 Island Cafe has a great selection of “park favorites”, where you’ll find dining options to suit the entire family. Curb your appetite on chicken tenders, burgers, hot dogs, corn dogs, grilled chicken sandwiches, chicken Caesar salads and pizza. The Cafe is also a good escape from the summer heat with an air-conditioned, indoor seating area. 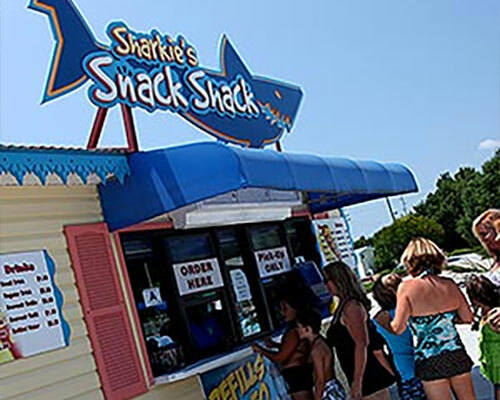 Curve your hunger quickly at Sharkey’s Snack Shack! The Shack can satiate your need for hot dogs, soft or stuffed pretzels, cotton candy and popcorn. Plus, cool off with the “ice cream of the future”- Dippin Dots® offers eight different flavors – try one today and tell us your favorite! Where we sell beer and snacks out of – including a special souvenir cup just for the adults! Located right by the Wave Pool and FlowRider® to curve all your hunger needs. From snacks to combo meals, this is the place to refuel for the day. Here you will find anything and everything you’ll need for a day in the sun. From swimsuits to water shoes, towels and sunbathing needs. Myrtle Waves souvenirs, goggles, key-chains, gifts and more is a perfect way to keep the memories of the splashes and thrills alive!